Missed out the renewal date of your bike insurance policy? Don’t know what to do next? Read out this article to find out the steps you need to take to renew your lapsed policy. Getting jitters thinking what do to do because you missed out the renewal date of your bike insurance policy? There could be several reasons for that – you were travelling, or someone in the family was unwell or probably you were just too busy working to have missed to renew your bike insurance. But mind you, you just can’t afford to be lazy, because being forgetful could be risky. Do you know riding your bike on the Indian road minus a valid third party insurance is a liable offence? You may have to shell out a lot of bucks from your own pocket in case of an accident or pay a heavy penalty to the traffic cop or probably you may end up going behind the bars if confirmed guilty (along with the seizure of your bike). Besides you can’t play with someone’s life. Now that you have realized to renew your lapsed policy, all you need to do is immediately contact your insurance company or online portal companies like Coverfox.com in case you have bought one from them. Call and inform them about the missed renewal date of your bike insurance policy. You need to be on the tip of your toe because you know you have missed out on an important agenda. Keep your documents handy like the vehicle registration certificate (RC copy) and the previous year policy copy. You know that your vehicle needs a survey since you rode your bike without a valid insurance for months together. Call and fix an appointment with the Insurance Company or the online portal for the bike survey. You might have to follow up vigorously and get the inspection done on priority. Some insurance companies do require inspection if you miss to renew your insurance policy. However some may not ask you to do so. A surveyor will come to your house or at your workplace as per your convenience. They would then find out of any pre-existing damage. If they found one, then you had it. You bike may stand rejected for renewal. In this case, it is recommended that you get your repairs done and re-arrange for an inspection. Post which, you can go ahead and renew your policy. Once the survey is done you can buy the insurance policy immediately. On being the inspection report positive, you can choose to renew bike insurance online through an online insurance portal or call up the insurance company. With some insurance companies, the inspection report stands valid for 24hours only. 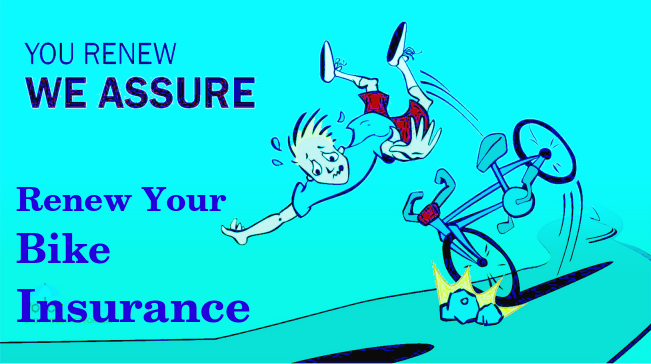 Therefore you ought to renew the bike insurance policy before the prescribed time frame. If you fail to renew your bike insurance policy within 90 days or say 3 months then you loose on your No Claim Bonus. Even though you have been a good rider in your previous year, you miss out to grab this reward of No claim bonus just because you missed to renew your policy on time. As you know NCB is a discount that you avail for every claim free year. It starts with 20% and remains stagnant up to 50% for each claim free year. You can’t afford to bear this loss if you haven’t claimed for last 3-4 years. So, the verdict is, be on vacation or busy at work do not miss out to renew bike insurance policy. The consequences would only get bad to worse if you fail to do so. Whether it’s an old or new bike, compromising on insurance is a strict no-no!